It seems that I get called upon frequently to add certificates to the Lotus Domino JVM cacerts keystore. I think the developers are using it for some sort of web service request. I thought I'd post it here in case there are other people like me who need to do this occasionally, and can never find the default password, or forget the syntax to install a new ssl certificate. Step 1 - Navigate to the Domino JVM security directory. For me, that's c:/lotus/domino/jvm/lib/security. For simplicity sake, I put the .cer certificate file in the security folder. It let's me quickly know which certificates I have installed in the cacerts on that server. 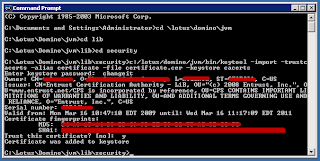 Step 2 - Enter the command to install the certificate in the keystore. The tool to use is called keytool, and it's located in the jvm/bin directory. The important part for you to change in the line above goes like this, the word after -alias signifies the name the certificate is referenced as in the keystore. The word after -file is the name/location of the certificate you are installing. The word after -keystore is the name/location of the keystore file. Once you enter all of this, and press enter, you will be prompted for the password for the cacerts keystore. The default password for the keystore is 'changeit'. Clever, eh? Enter the password (changeit) and press enter again. Step 3 - You will be prompted to accept the certificate. Type 'y' or 'yes', if you trust it. 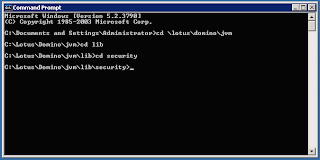 Step 4 - Restart your Lotus Domino server or service. Try to do it when there are no users on the server. Causes less complaining. Let me know if you found this useful. I've added it to the Lotus Notes and Domino Wiki, and registered to win free stuff from WikiMadness. Thanks for this, I just had to do this and it's not documented (or at least I couldn't find it).